How Can You Tell If Your Dog or Cat is Bored? 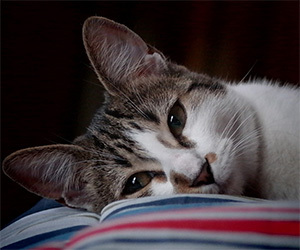 We don’t know if cats and dogs truly perceive boredom like humans do. Instead, when talking about pets, I like to use the phrase “insufficient mental stimulation.” Have you ever seen your cat literally try to climb a wall, repeatedly jump on your shelves to knock items off or leap onto the chandelier? Or has your dog ever tried to dig up your wall-to-wall carpeting or decided that it’s fun to play tug-of-war with the curtains? These could all be signs that your pet is not getting enough mental stimulation. Often pets are left at home when owners go to work or spend a great deal of time outside of the home due to other demands, such as school or family commitments. Many times, these pets suffer from insufficient physical and mental stimulation. In the absence of adequate outlets, our pets may engage in activities of their own making. These activities can include appropriate behaviors, such as playing with toys, or inappropriate behaviors, such as chewing on furniture or knocking items off a table. Additional inappropriate or undesirable behaviors include excessive attention seeking, unruliness, vocalizations, playing keep away with an owner’s items or self-directed behavior, such as a pet chasing his own tail. Dogs may engage in normal “dog” behavior, such as digging in dirt, but to a greater extent than is tolerable — so instead of one hole in the lawn, your backyard may look as if it is being excavated. For cats, normal “cat” behavior includes chasing moving objects — but that could include your ankles as you walk around the house. If your pet exhibits any of these behaviors excessively, ask yourself how much physical and mental stimulation you are offering him. Much like humans, dogs and cats appear to enjoy regular mental stimulation and physical activity. Domesticated cats and dogs typically still engage in certain species-specific activities, such as hunting for food, which can take up a large portion of their waking hours. Even though pets have been domesticated, they still have a drive to engage in these instinctive behaviors. To help satisfy these compulsions, owners can have their pets “work” for their food. Here are a few ideas. At each meal, divide a portion of your dog’s meal into two or three food puzzle toys. These toys are designed to release food items gradually as the pet interacts with toys. So, for example, instead of inhaling a meal in two minutes flat, your dog will spend 10 to 15 minutes engaged in a good physical and mental activity trying to access his food. When it comes to cats, felines in the wild can spend up to 40 percent of their day hunting for food, and domestic kitties still have that impulse. For that reason, I like to provide my cats with three to five meals throughout the day. I use a variety of puzzle toys and offer two to three toys in the morning before I leave for work, a few more at dinnertime and then again right before bedtime. This way, my cats will sleep through the night and (hopefully!) not wake me up early for their breakfast. Cats in particular may need to have their food gradually added to the puzzle toys. For example, at first I put a portion of their meals in their bowls and a portion into two toys. I move the toys around and show them how to use them. Sometimes I may smear a bit of canned food onto the toys to encourage them to explore them. This technique also works for dogs. Another way I encourage my cats to “hunt” for their meals is by hiding their food bowls around the house. I start by placing one bowl in the cat’s normal feeding area, then place additional bowls in other areas that I know the cat will walk by or rest close to. Once a cat starts to consistently eat from the bowls, you can move them a few feet away from the original locations. This will encourage the cat to explore the house and search for his food. In multiple-pet households, scatter several toys in different rooms or levels of the house. In the beginning, always closely monitor pets to make sure they know how to work a toy and ensure that there is no fighting over food treasure. You can always close a door or use a pet gate to ensure that one pet does not eat all the food meant for two or more. Another way to fight boredom is to make sure your pets are getting enough physical exercise. 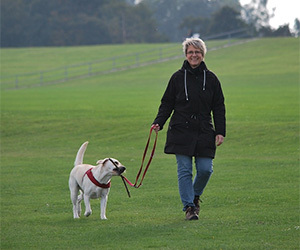 Taking a dog on at least a daily walk is a good way to provide exercise and enhance mental enrichment. Engaging your cat in a daily game of chase using an item dangling from a fishing pole or tossing an object she can retrieve can also fulfill her physical and mental stimulation needs. Offer various cat trees or ledges for your cat to climb up or jump onto. Social interaction is vital as well. Make sure you spend quality one-on-one time with your pet. It could be engaging in games, training desirable behaviors using positive reinforcement, or just petting or snuggle time. Remember, no matter what the activity is, spending time with your pet is one surefire way to combat his boredom. And if you’ve tried all these recommendations but still feel like your pet is “acting bored,” don’t hesitate to seek professional help.